The most efficient and effective way to underwrite, value, and share commercial real estate property data. 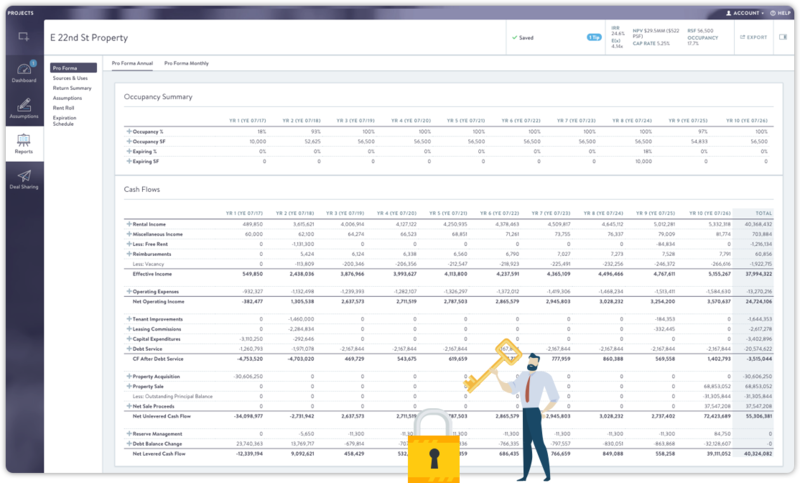 With Assess+RE, creating and evaluating single and multi-asset cash flows, financing options, complex rent rolls, leasing assumptions, and other key performance analyses have never been easier to do, or understand. Developed by industry leading experts, our detailed sample models and robust computation engine enable you to finish your analysis faster than ever. Speed is the new currency for those who underwrite, manage, and transact commercial real estate assets at scale. 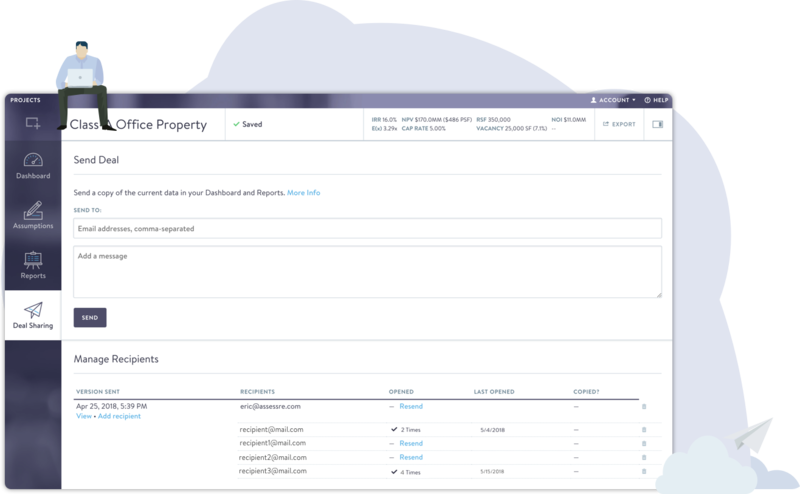 With a streamlined and collaborative workflow, Assess+RE provides you and your colleagues, clients, and financial partners with powerful tools and analytics from the tenant level up to your executive dashboards. 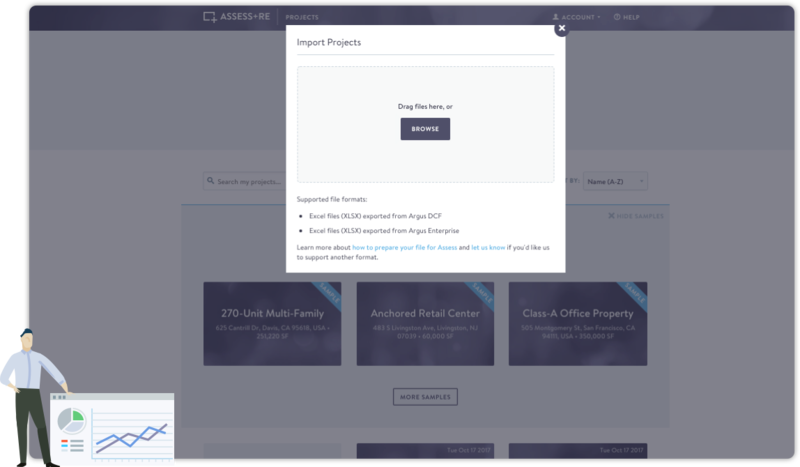 With Assess+RE's intuitive assumption interfaces, dashboards, and reports, Argus and Excel are no longer necessary to determine the most accurate financial information about your commercial real estate assets. We make adoption and migration simple. Import existing Argus Enterprise, Argus DCF, and structured Excel data to continue right where you left off. View institutional-quality reports including industry vetted pro-forma, sources and uses of funds, return summary, assumptions summary, rent roll, expiration schedules, and more. Reports are always ready to print or export to PDF and Excel as you work. Contact us to learn more about how Assess+RE can customize reports for your enterprise! Share your property analysis with your partners, contacts, and prospects. Get better engagement insight with recipient metrics, and easily manage who can view and access your financial model. Assess+RE is accessible through Google Chrome on your computer, tablet, or smartphone. Our platform’s reliability and scale is provided by Amazon Web Services to ensure the best performance and security with your Assess+RE subscription. Deliver transparency, automation, and valuable insights from your entire real estate portfolio. 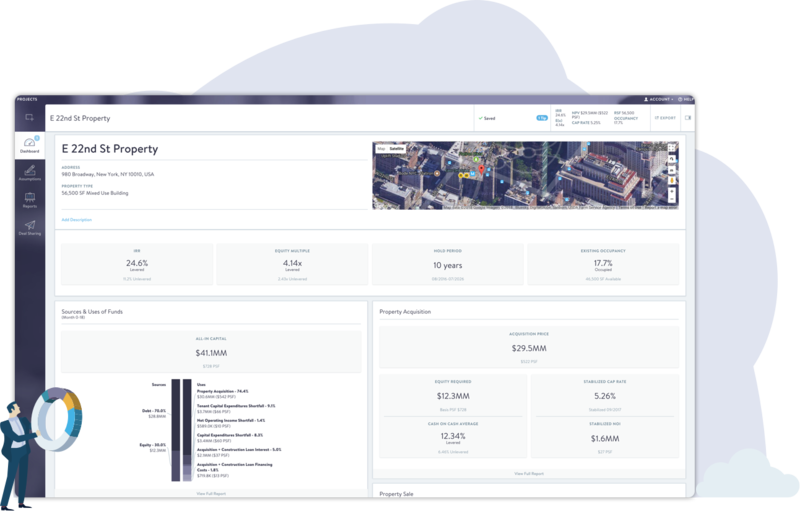 With a streamlined and collaborative workflow, Assess+RE provides you and your colleagues, clients, and financial partners with powerful tools and analytics from the tenant level up to your executive dashboards. "This is definitely the most user-friendly modeling tool out there. I really appreciate the simple and clean interface as well as its compatibility with Excel. I’ve used other modeling tools for some time but Assess brings together the analysis in one of the easiest, fastest and cleanest experiences. " "Assess packs a powerful all-in-one punch in an industry that typically requires two or three platforms to underwrite a deal, allowing me to spend less time building models and more time thinking about creating value. " "Assess is an industry-transforming program, and I expect that it will quickly become the standard. " Thanks to our dynamic user experience, robust computation engine and seamless workflow, Assess cuts down on cost and time spent to underwrite CRE.